DHYSTAR Motorcycle / Electric-Bike Phone Holder Mount with 5V 2A USB Charger Port with 2 Exchangeable Handlebar Holder and Aluminum Rear-view Mirror Base:Two installation methods based on your needs, Not only can be installed on the Motorcycle Handlebar, but also can also be installed under the motorcycle rear-view mirror base.Built-in 5V 2A Fast Motorcycle Phone USB Charger Port, Keeps your mobile devices charged anytime when you need, Don't worry about your cell phones power off while riding. -Motorcycle/Electric-Bike phone with usb fast charger, input voltage: DC 12-85V, Output: DC 5V 2A. -Cable Length: 1.6 m (62.99 inches). -Built-in intelligent identification circuit, intelligent fast charging, fully compatible with more than 99% of the smartphones, such as: iphone, samsung, etc. -Built-in intelligent charging management chip: full protection of your phones while charged on the motorcycle. 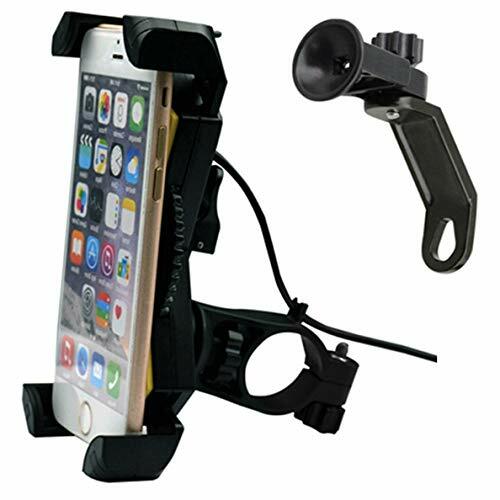 -Good stability: Four corners locking structure to lock your cell phone secure and Guarantee your phone not falls off from the motorcycle phone holder. -Material: ABS plastic + Waterproof USB Charging Port Cover. -Aluminum Mirror Base: Left and right rear-view mirror can be installed. -Connect Red Wire to Motorcycle / Electric-Bike's Positive Pole, Black Wire to Negative Port. -With USB Charging On / Off Switch, Keeps the Switch "On" while charging your device. -Not fits for very thick case users, It accommodates 0.5 inch thickness for a phone with a case; Universal Phone Holder just fits your phone with simple thin protection cases. If you have any questions about this product by DHYSTAR, contact us by completing and submitting the form below. If you are looking for a specif part number, please include it with your message.